3042 leaves Manchester Victoria on 10 May 2017. Britain’s two first modern tram systems present an interesting contrast, and visiting them both over the same two days highlighted many of the interesting differences between these networks. From 1962 until 1992, Blackpool was home to the only surviving standard gauge tram system in the UK. 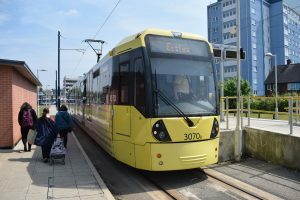 However the success of the Tyne and Wear Metro and Docklands Light Railway systems encouraged research into how the more modern ‘light rail’ concept could ease congestion in other major cities. Manchester had a long-held ambition to link its two main stations, Piccadilly and Victoria, and after an underground option had been dismissed as too expensive, a route through the streets became favoured as a more viable option. 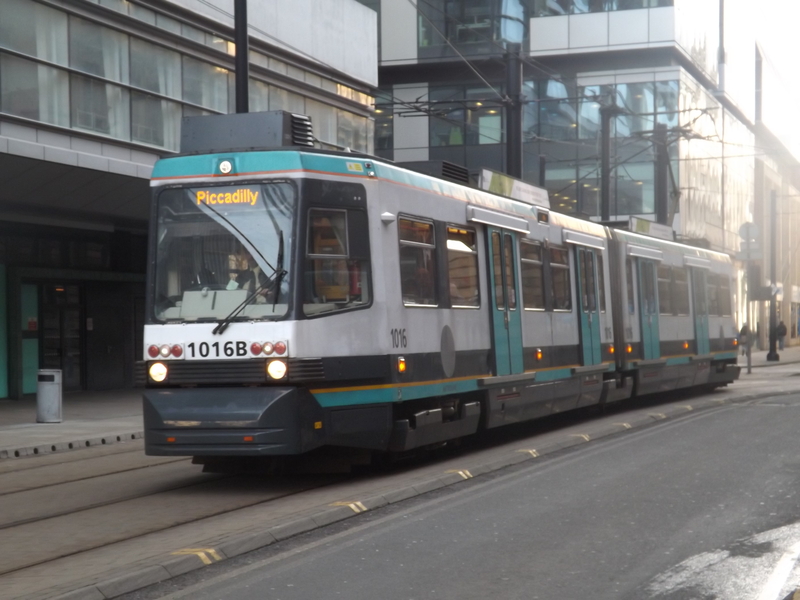 One of Metrolink’s original Ansaldo-Breda T68 trams during my 2013 trip to Oldham. In the early 90s many people could still remember Britain’s original pre-war tram systems, and the image of trams as slow and lumbering obstructions was still in the public consciousness. The new Metrolink system was very much presented as ‘light rail’, with the city-centre section of street running there to connect together Piccadilly station and the former heavy rail lines to Bury and Altrincham. In the city centre the system largely ran on its own alignments away from general traffic and used high-level platforms like those on the former heavy rail lines to allow level boarding. 121 at Fitzalan Square, 10 May 2017. 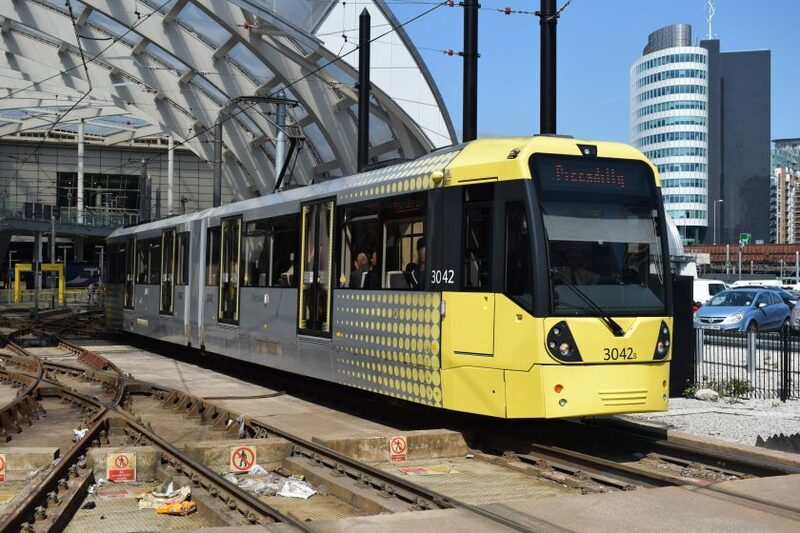 Metrolink’s success went a long way towards improving the public image of trams in the UK. In 1994, two years after Metrolink opened, across the Pennines Sheffield launched its own tram network. The “Supertram” embraced the identity of the tram, with far more street running along much of the length of two of its three lines. It also embraced the newly developed low-floor technology, allowing easy level boarding with platforms just 350mm high. 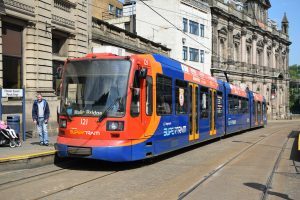 Unlike the Metrolink, which was assembled from two former heavy rail lines connected by short sections of street running, the Supertram was a far more ambitious scheme comprising three brand new routes built from scratch (along with two short branches). For a time it struggled to generate the kind of passenger numbers Metrolink was enjoying, but after operation was taken over by Stagecoach Group in 1997 the system’s fortunes started to change. 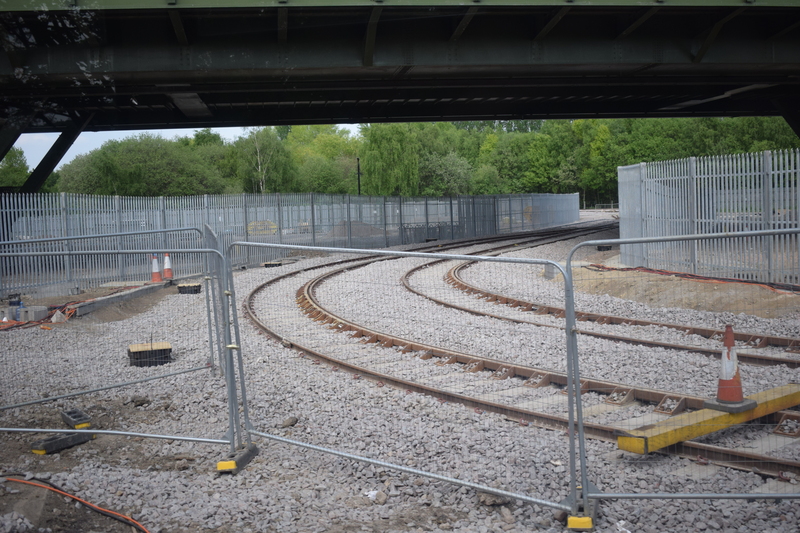 The new Metrolink terminus at Ashton-Under-Lyne, 11 May 2017. 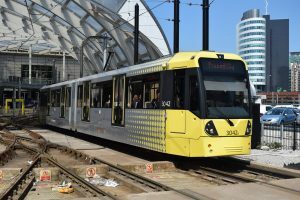 Manchester’s Metrolink system has now changed beyond all recognition. An extension to Eccles in 2000 introduced more street running, but since 2010 the system has trebled in size with new lines to Oldham and Rochdale, Ashton-Under-Lyne, East Didsbury and Manchester Airport, along with a second city centre route and a new line to the Trafford Centre now under construction. The entire tram fleet has been replaced with a fleet of over 100 modern Bombardier Flexity models. Sheffield’s Supertram has changed comparatively little on the other hand. The entire original Siemens Duewag fleet is still in service, albeit in a new livery, and no extensions were built until construction started recently on a new branch to Rotherham. This will be Britain’s first tram-train system, not just taking over a heavy rail alignment, but sharing it with main line train services. Seven new tram-trains have been delivered for the new line, which will hopefully bring Supertram back into the spotlight and encourage the system to develop more in the future. 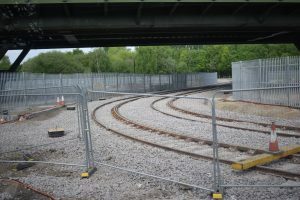 The new Supertram branch to Rotherham under construction, 10 May 2017. The concepts pioneered by both systems have allowed other networks to be developed in Birmingham, Croydon, Nottingham and Edinburgh. The Croydon and Nottingham systems in particular have been huge successes in their own right, proving again how well-designed light rail networks can often be the solution that congested major cities need.